MRS ADEBIYI OLUBUKOLA obtained a B.Sc degree in Management and Accounting from Obafemi Awolowo University (OAU) in 2002. In 2008, she obtained an EDS Certificate in Entrepreneurial Management (CEM) from Pan African University (LBS) while in 2013 she obtained an Executive Masters Course Certificate in Project Management from the British School of Project Management. She worked briefly in two organizations before launching off on her own on February 1st 2004 to start Just J Ventures, a supply company. 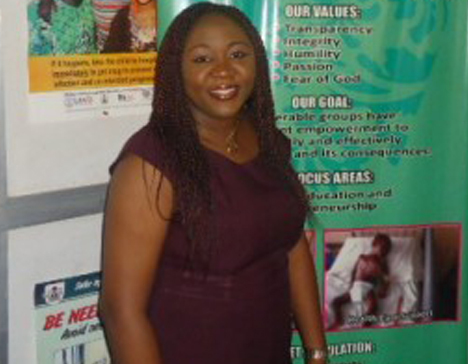 Since October 2004, young but naturally endowed with a strong leadership and entrepreneurial spirit, her passion for God and huge burden for the less privileged led her into establishing and managing Jakinminis International Company limited by guarantee (JAKIN N.G.O), where she serves as the President/Chief Executive Officer. So far, JAKIN has assisted over 50,000 less priviledged people in Nigeria and as far as Liberia, Sudan, Darfur and Chad. Her zeal and commitment earned her eight humanitarian service awards. In 2008, she won a one year Scholarship under the Goldman Sachs Bank (USA) 10,000 women initiative to empower 10,000 women entrepreneurs in emerging and developing countries across the world. Mrs Adebiyi is a resound motivational speaker and facilitator. She is a lover of children and a mentor to hundreds of youths and women. She is happily married to Dr Olubunmi Adebiyi and blessed with a son.